Edinburgh is getting ready to play host to some of the UK’s biggest animation studios, as part of Scotland’s largest commercial animation event. 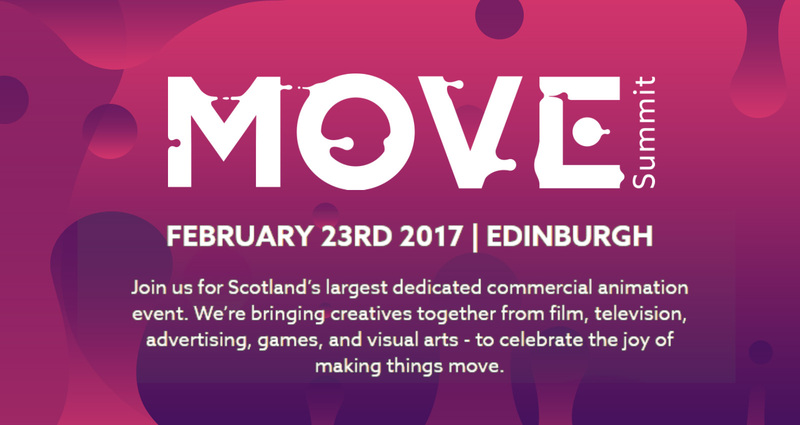 Move Summit 2017 takes place on February 23rd, and features appearances from 59 Productions, Axis Animation, Red Knuckles, and a host of other big name talent. The event will be a rare opportunity to glimpse behind the scenes on some of the most exciting animation work of the last few years. Move Summit is also a chance to celebrate the talent of tomorrow: the students and recent graduates who are building their career in the animation industry. An exclusive Emerging Talent workshop forms a central strand to the event, with a chance to interact with industry mentors and make valuable connections for the future. Award-winning Scottish studios Axis Animation, Interference Pattern, Whitespace, Once Were Farmers and Werewolf will be joined by talent incubator Animation Centrifuge, to offer insight and knowhow. In addition to the top-notch lineup of speakers, attendees can look forward to hands-on technology previews, a live animation project, and a chance to network with fellow animation professionals at an evening event in Edinburgh’s bustling Old Town. Move Summit will be hosted at Whitespace, just off Edinburgh’s Princes St. Tickets are available now, starting at £50. Early bird pricing is available until January 31st.